What's in Your Science Center? 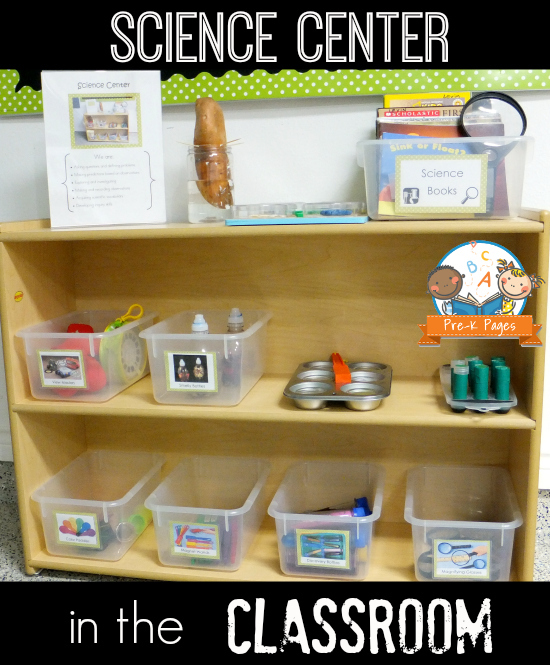 The science center is a high interest center in any preschool or kindergarten classroom. Kids love the science center because it provides plenty of open-ended opportunities for them to discover and explore. While the science center is one of the favorite centers in any early childhood classroom, science items can be the most expensive to purchase. The good news is that you don’t have to break the bank to provide your kids with science materials and activities in the classroom. Below are some of my favorite ideas for creating an inexpensive, fun and inviting science center. The best thing about creating things for the science center is that it makes it easier to change things up when they become stale. Rotating items in the center as you notice interest waning is key to keeping kids engaged and on task during center time. I don’t suggest starting the year with all of these items on the shelves in your science center. As the science materials are introduced to the children; then they go to “live” in the science center. 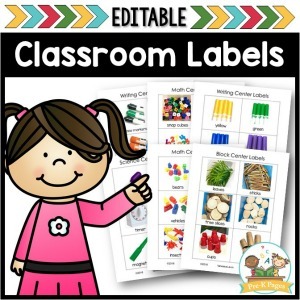 The key to keeping any center in your classroom neat is to have a picture label on each end of the tub (along with the words too) and a matching label on the shelf. This method will set your kids up for success when it’s time to clean-up. Having center signs is also very helpful. 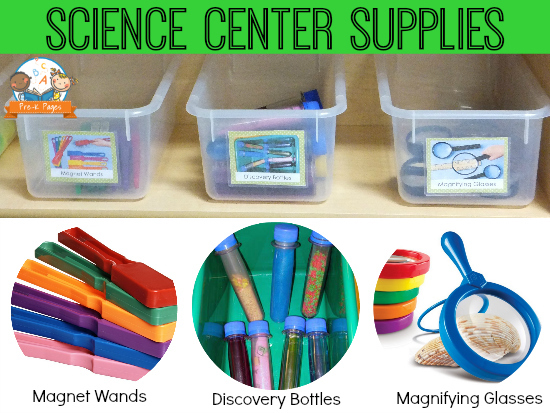 Here are some of my absolute “must-have” science center supplies that can stay out all year long. Having something alive and something growing all the time in your science center will provide children with opportunities to make observations and record data. See the printable science observation notebook on the science page HERE. The things that are living and growing can change as needed. Think of a class pet and a plant you can grow. I have found that having fish and a sweet potato are very low maintenance and work best for me. If you have a green thumb or access to exotic pets, go for it if your school allows it. You can find the recipes for the discovery bottles HERE. Having books in your science center that have colorful photographs is a must. 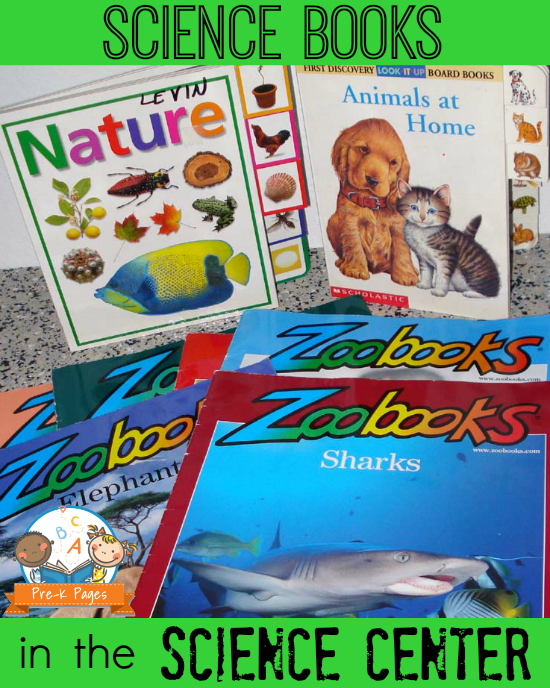 Kids just love to look at pictures of animals, bugs, and nature up close on the pages of magazines and books. 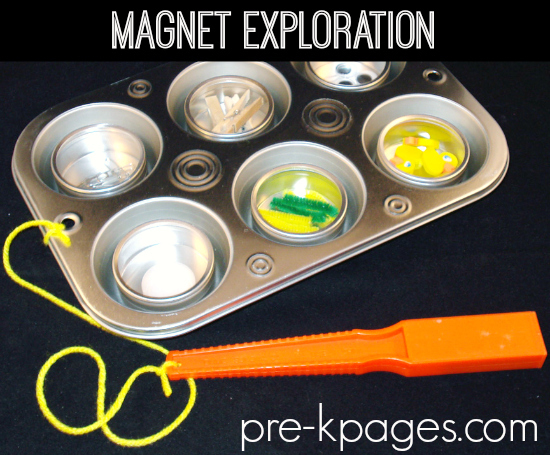 This is an inexpensive magnetic exploration tray I created for my science center. Kids can use the magnetic wands to discover magnetic properties. 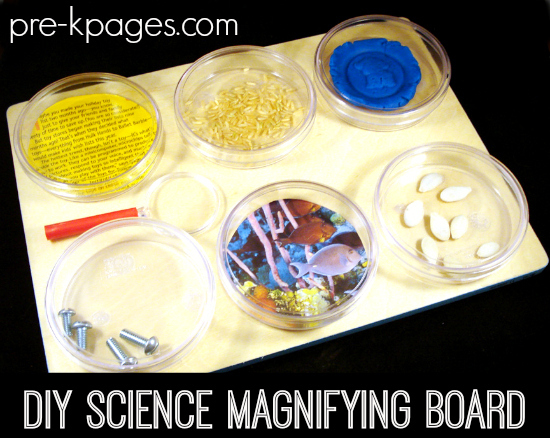 This is an inexpensive magnifying board; kids can use the magnifying glasses to look at the items in the petri dishes. 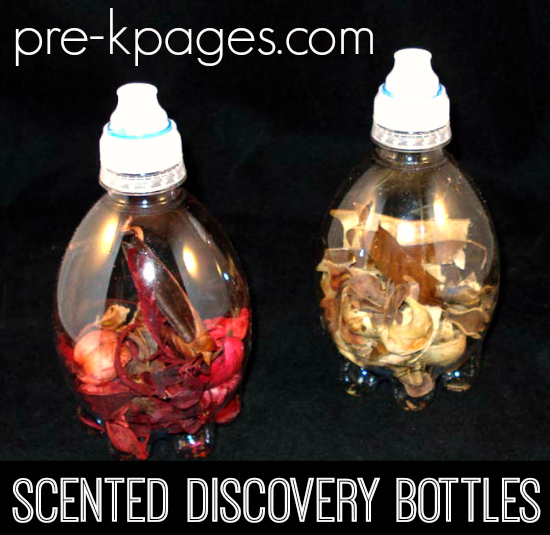 These scented discovery bottles are always a huge hit in the science center and they’re very inexpensive to make! 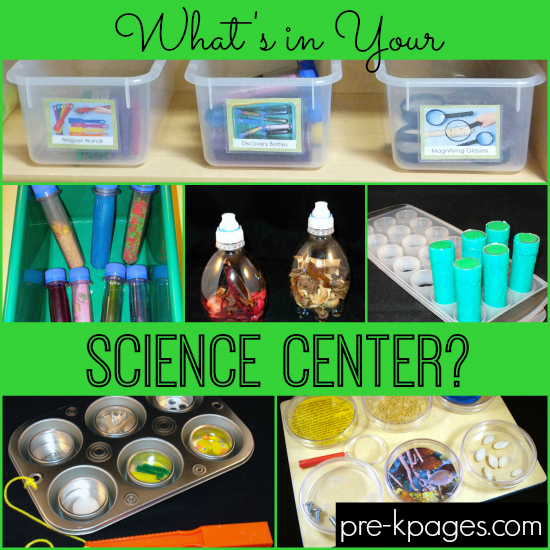 Visit the Science Center page for more inexpensive items you can make for your science center. Vanessa, I really have enjoyed this series on your blog. 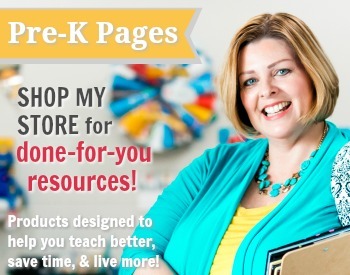 Great information and good for stimulating new ideas. I think that it’s important to change/rotate items. 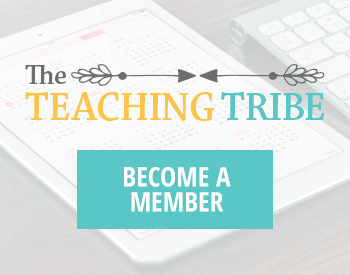 Teachers seem to do a good job of changing and refreshing other centers regularly. Often the science center gets a few items that stay the same all year. In addition to books, there are some great kids science magazines out there. I’ve subscribed to National Geographic Kids (for my 2nd graders) but there’s also a Little Kids version. It’s got great pictures and information. Thank you for sharing Scott! I definitely agree with changing out items as you see interest waning. Keep the science center fun and fresh and they will flock to it 🙂 Love those magazines too! I love your science center! I also like to add “loose” materials and bottles with funnels sometimes so students can make their own discovery bottles. I also like to use Kleenex boxes filled with items that students can reach in and feel and use their knowledge to figure out what it is. One more thing I like to have are some scales and rulers. The one thing my kids love at the science center is dressing up like a scientist! ( white coat and goggles) thank you for sharing! I will add some of your great ideas! Thank you so much for sharing Christie! Your science center sounds like a fun place to play and learn! In my Discovery Center I also include activities that go with the items. For example I have measurement sheets to document the length of pine cones and sorting sheets for shells and rocks. It gives the students something to focus on rather than just pulling out items without direction. Hi Oana, my rules are the same for all centers. Treat the materials with respect- that includes putting them away and not breaking them etc. I always model appropriate uses and non-uses of each item as it is introduced to the center area. Hope that helps! I love the recording sheets and plan on getting some, but don’t underestimate the power of a blank sheet of paper! When we talked about plants, I encouraged observation and still life drawings. One of the kids stayed in that center drawing the flower the entire morning! Agreed, blank paper is an open invitation to create! Thank you for sharing! 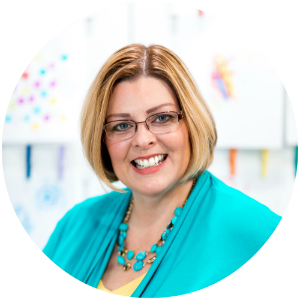 I was in such a rut, looking at your website gave me the excitement to create again! Thank you Angie, I’m so glad you were inspired! 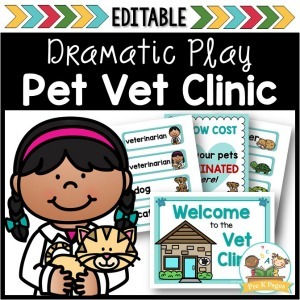 Vanessa, I love all of your ideas and we are implementing many of them at my preschool. Can you please direct me to the Science sign shown in the picture that states “We Are”. Thank you. Thanks for stopping by, I’m glad you enjoy the site!